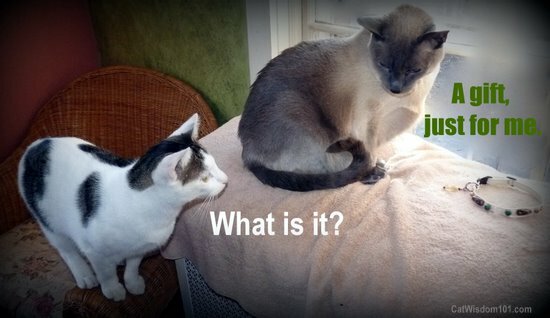 We’re back from a mini-blog pause. Santa arrived early on Saturday with a parcel from RockSpirit Designs. We’d already received a gift of their gorgeous (and calming) earrings from my friend Ingrid from The Conscious Cat and were thrilled with our RockSpirit giveaway. It’s one thing to see a pretty picture of something, it’s quite another to hold it in your hands. The collar was a thing of beauty but also felt powerful, magical and hopefully would resonate with its recipient. Of course Odin had be nosy. 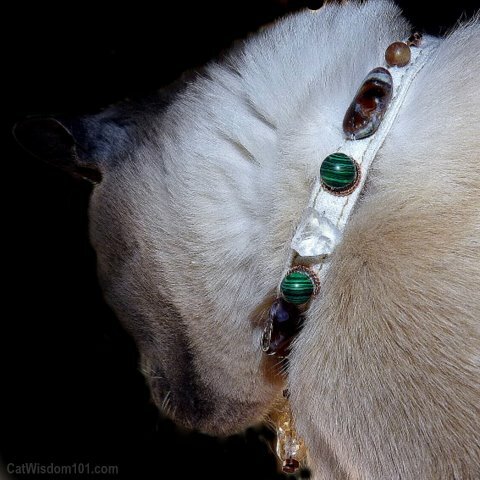 Fern Slack, a vet who creates the enchanting RockSpirit jewelery and healing stone pet collars, made Merlin a custom collar based on his needs. Fern and I chatted about Merlin’s medical history and she scanned his recent medical records for data. Armed with her professional knowledge, she slips from left brain into intuitive right mode and meditates and on which stones to select. Stones and crystals vibrate with subtle healing energy. Every stone has it’s own energy and to combine several in harmony and balance requires a shaman’s touch. I’ve worked with stones and crystals for over twenty years and have grown to appreciate their gentle healing, but would Merlin? This proved interesting. Merlin has never enjoyed wearing collars or anything on his neck. He’ll indulge me for a few minutes to takes photos of him wearing a festive bow, but that’s it. Fern felt an un-dyed natural hemp collar would be a good choice for cats who don’t normally like collars or are allergic to plastic. It also complimented Merlin’s Siamese coat. 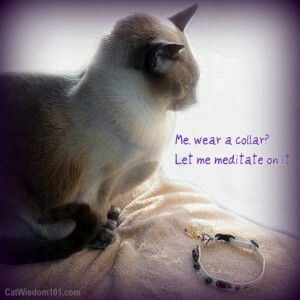 I communicated with Merlin what kind of collar it is, who made it and why. I’d had the phone on speaker when Fern talked about Merlin and he always knows when he’s being talked about. He knew this was no ordinary collar. I asked him if he’d like to try on the collar of rock crystal, copper, malachite, fire agate and sunstone. He sat like a king about to receive a crown. The collar snapped in place and for the first time ever, he accepted it. It had an instantaneous effect of balanced calm and dare I say, regal pride? I dunno if it heals, but it sure is a pretty necklace! I can’t wait to read about what happened!!! 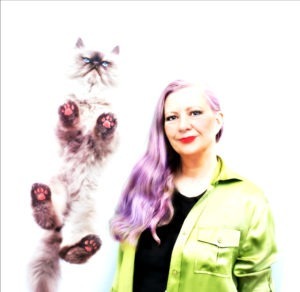 I believe in their healing power as well and am purring that they worked on Merlin! 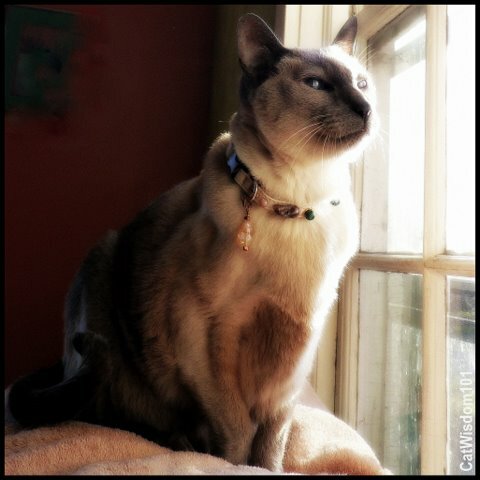 My kitty, King Arthur, loves his collar that we won in your giveaway. He wears it and looks very regal. I believe in the healing ability of the stones and appreciate all the knowledge that was shared with me from Fern Slack. She is truly amazing! Thank you so much for hosting the giveaway! Tammy, thanks for stopping by. Congrats again on winning. I’m so glad your kitty King Arthur loves his collar. They truly are fit for kings and queens. What a beautiful collar for a most beautiful boy. I do hope it gives Merlin a sense of peace (which it appears to be doing in the photos) and eases any discomforts he has as well. The healing stones and crystals are quite fascinating. 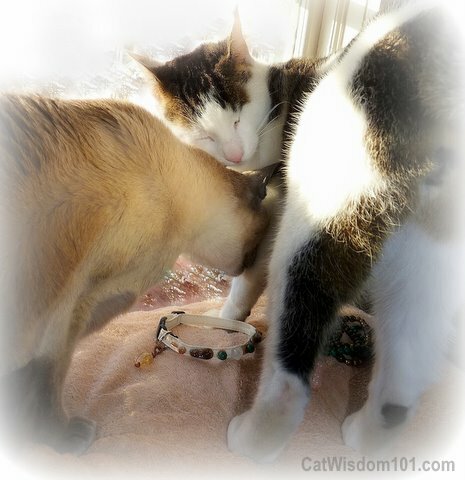 I don’t know much about this but would like to know more…..
You do look like a ring in your beautiful calming collar. Whisky, Cosmo and Ling each wear a crystal to keep them well and safe from harm. So far, so good. Can’t wait to read about how the crystals helped Merlin. I’m fully convinced these would be effective. I have placed healing stones in beds, and even had my Lucy wear a piece of amber on a cord in the last months of FIP, all to the better. I look forward to hearing more. Those are so beautiful, I must check them out! We can’t wait to hear how this collar does! We will check out Fern’s site. Fern is the best feline vet I’ve ever met (and I’ve met a lot of them), and I’ve been fortunate to have had her as Buckley’s and Amber’s vet. It has been a magic of its own to watch her transformation from conventional veterinarian to stone healer. 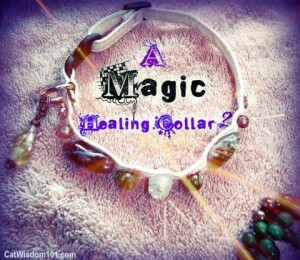 What makes it magical to me is that she combines her veterinary background with her intuition to create these collars. I can’t wait to hear part two of this story!